After over twenty years of working with the food production industry, Eaglestone knows what it means to be clean. Standard sanitation processes are often not enough for larger, highly regulated industries like meat packaging and processing. For those bigger production lines, we’ve created the new Ultra Clean Conveyor. 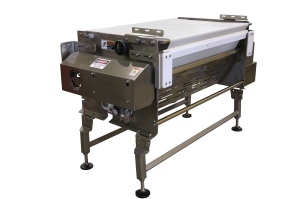 With a more durable stainless steel body and numerous variations for the belt, this conveyor can be customized to fit any industry’s needs while maintaining a supremely sanitary environment for production. Protective features were added to allow for simple, painless cleaning, so that you can get rid of downtime and get back to production. The Ultra Clean lives up to its name by providing clients with more choices to create the most sanitary conveyor for the product. It is fully welded with minimal seams, allowing dramatically less bacteria build-up than its competitors. Covered motors with angled tops keep water and debris from collecting while protecting the motor during cleaning and other maintenance. Additional vents also allow for better drainage, and an option for dual scrapers and a continuous belt make for an incredibly hygienic surface. The Ultra Clean Conveyor is heavy duty – made from 75% thicker steel than other competitive conveyors – and can be used in aggressive environments with heavy equipment. The added durability makes the Ultra Clean ideal for the meat industry. This beefed up conveyor also offers customizable belt materials to fit any type of production. The ability to fine tune the belt angle with a simple knob is a unique feature that can be added to flip the product with ease – a difficult task for the traditional conveyor. The Ultra Clean Conveyor is always built to meet USDA standards while offering complete customization to fit every application. With its durability and super sanitary design, the Ultra Clean Conveyor is certain to leave your production line with a clean conscience.